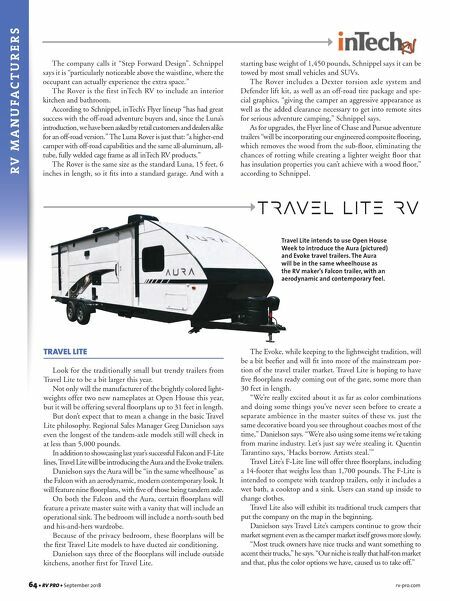 64 • RV PRO • September 2018 rv-pro.com R V M A N U F A C T U R E R S TRAVEL LITE Look for the traditionally small but trendy trailers from Travel Lite to be a bit larger this year. Not only will the manufacturer of the brightly colored light- weights offer two new nameplates at Open House this year, but it will be offering several floorplans up to 31 feet in length. But don't expect that to mean a change in the basic Travel Lite philosophy. Regional Sales Manager Greg Danielson says even the longest of the tandem-axle models still will check in at less than 5,000 pounds. In addition to showcasing last year's successful Falcon and F-Lite lines, Travel Lite will be introducing the Aura and the Evoke trailers. Danielson says the Aura will be "in the same wheelhouse" as the Falcon with an aerodynamic, modern contemporary look. It will feature nine floorplans, with five of those being tandem axle. On both the Falcon and the Aura, certain floorplans will feature a private master suite with a vanity that will include an operational sink. The bedroom will include a north-south bed and his-and-hers wardrobe. Because of the privacy bedroom, these floorplans will be the first Travel Lite models to have ducted air conditioning. Danielson says three of the floorplans will include outside kitchens, another first for Travel Lite. The Evoke, while keeping to the lightweight tradition, will be a bit beefier and will fit into more of the mainstream por- tion of the travel trailer market. Travel Lite is hoping to have five floorplans ready coming out of the gate, some more than 30 feet in length. "We're really excited about it as far as color combinations and doing some things you've never seen before to create a separate ambience in the master suites of these vs. just the same decorative board you see throughout coaches most of the time," Danielson says. "We're also using some items we're taking from marine industry. Let's just say we're stealing it. Quentin Tarantino says, 'Hacks borrow. Artists steal.'" Travel Lite's F-Lite line will offer three floorplans, including a 14-footer that weighs less than 1,700 pounds. The F-Lite is intended to compete with teardrop trailers, only it includes a wet bath, a cooktop and a sink. Users can stand up inside to change clothes. Travel Lite also will exhibit its traditional truck campers that put the company on the map in the beginning. Danielson says Travel Lite's campers continue to grow their market segment even as the camper market itself grows more slowly. "Most truck owners have nice trucks and want something to accent their trucks," he says. "Our niche is really that half-ton market and that, plus the color options we have, caused us to take off." The company calls it "Step Forward Design". Schnippel says it is "particularly noticeable above the waistline, where the occupant can actually experience the extra space." The Rover is the first inTech RV to include an interior kitchen and bathroom. According to Schnippel, inTech's Flyer lineup "has had great success with the off-road adventure buyers and, since the Luna's introduction, we have been asked by retail customers and dealers alike for an off-road version." The Luna Rover is just that: "a higher-end camper with off-road capabilities and the same all-aluminum, all- tube, fully welded cage frame as all inTech RV products." The Rover is the same size as the standard Luna, 15 feet, 6 inches in length, so it fits into a standard garage. And with a starting base weight of 1,450 pounds, Schnippel says it can be towed by most small vehicles and SUVs. The Rover includes a Dexter torsion axle system and Defender lift kit, as well as an off-road tire package and spe- cial graphics, "giving the camper an aggressive appearance as well as the added clearance necessary to get into remote sites for serious adventure camping," Schnippel says. 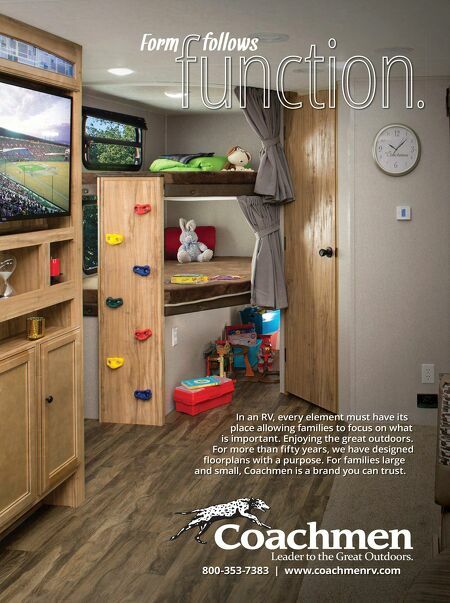 As for upgrades, the Flyer line of Chase and Pursue adventure trailers "will be incorporating our engineered composite flooring, which removes the wood from the sub-floor, eliminating the chances of rotting while creating a lighter weight floor that has insulation properties you can't achieve with a wood floor," according to Schnippel. Travel Lite intends to use Open House Week to introduce the Aura (pictured) and Evoke travel trailers. The Aura will be in the same wheelhouse as the RV maker's Falcon trailer, with an aerodynamic and contemporary feel.